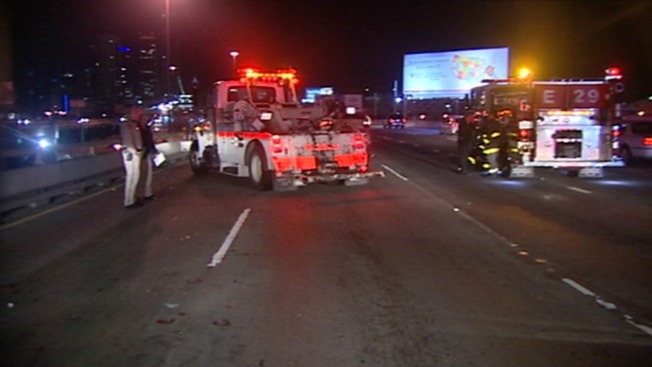 A person walking on eastbound Interstate 80 just west of the Fourth Street off-ramp in San Francisco was struck and killed in a traffic collision early Tuesday morning, according to the California Highway Patrol. CHP officer Jake Johnson said authorities initially received a call about a person running in and out of lanes on the freeway. A short time later authorities received another call about a car colliding with the pedestrian. The pedestrian ended up on top of a grey Porsche and was pronounced dead at the scene, according to Johnson. CHP officer Damian Cistaro said a Sig-alert was issued at 3:56 a.m. as the 1, 2 and 3 lanes were closed as police investigated the collision. All lanes were reopened at 4:38 a.m.